The Food-Minded Mama: Treat 'em like Mikey. They'll eat it. They'll eat anything! Treat 'em like Mikey. They'll eat it. They'll eat anything! So what does a Food-Minded Mama do when she has to feed a baby, and then a little kid? Give 'em the good stuff of course!! I realized from the very beginning that if I gave her something to taste that she would try it. Even if I had to force the subject a bit (and yes by that I do mean shoving food into her mouth), 9.5 times out of 10 she would eat, and like what I had given her. Of course, especially in her first year, I stayed away from really spicy food, potential allergens, or things that may be too hard to chew, but all in all, anything was and is game. Kids get bored with monotony too!! Serve different kinds of bread as toast. One day give 'em multi-grain bread, the next day toasted baguette, and the next biscuits. Of course I don't mean every day, but just switch it up!! Offer different toppings for their toast: different jams and jellies, butter, peanut butter, cream cheese, Neutella. And when they're old enough, let them do the spreading. This will help them with their fine motor skills, let them feel a sense of ownership with their food and they'll unquestionably try some combinations that you would have never thought of that will increase their palate. Cereal. Please, oh please!! Stay away from sugar cereals. In my opinion it sets kids up for wanting terribly sugary foods and it's just not good for them. 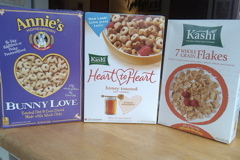 Instead, serve them Annie's Bunny Love toasted oat & corn cereal, or Kashi Honey Toasted Oat cereal. Of course my kid always wants what I'm eating. Even though some of the flakes in my bowl are too big for her mouth, she insist on eating my Kashi 7 Whole Grain Cereal. When you are introducing a new food, NEVER grimace or pull a yucky face when you give it to your kid, even if it's something that you don't particularly like. Let them make that decision for themselves. They'll tell you if they like it or not, but only believe them until they have truly taken a bite, chewed AND swallowed it. If it's a staple at your dinner table and they say they don't like it, reintroduce it later being sure not to remind them that they didn't like it before. Who knows? Maybe they will this time.